Muttland Meadows, Inc. Dog Park is a tax-exempt, non-profit organization that exists solely on donations from its patrons for its financial support. These donations are used for maintenance and improvements. Muttland Meadows is supervised by Officers and a Board of Directors that oversee the management of the park. In order for this wonderful dog park to function properly, it must rely on the people who use it to MAINTAIN IT! That means EVERYONE is expected to volunteer their time and expertise along with their financial help. PLEASE keep Muttland Meadows open to everyone by volunteering and donating! Joseph Uihlein Jr. was frustrated and angry. He could not find a place to run his beloved poodle, Jose. They had been chased out of the public parks for the last time. Joseph said, “This is gross discrimination. We can’t put up with this.” So Joseph decided to start a dog park of his own. In 1978, Joseph Uihlein Jr. purchased seven acres off Green Bay Rd. directly across from Lime Kiln Park for just that purpose. The Uihlein’s, Joseph and Georganna thought it would be an ideal place for Jose, who only had a “postage stamp sized backyard” to play in. But then Joseph said; “What the hell; we’ll do it for everyone.” Greg Kuehn, a landscape architect from Treetops Design, Inc. of Grafton, did the planning of Muttland Meadows. After listening to his friends talk about their dream for the project Greg was able to capture just the right “doggie” atmosphere. Hence: Muttland Meadows. 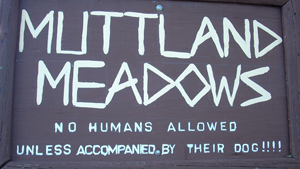 So in 1981, Muttland Meadows was open to the public. With only one stipulation: Enter only if you are accompanied by a dog. A haven for man’s best friend, Muttland Meadows today includes some of the original dog houses, authentic fire hydrants as well as numerous signs and doggie trails. 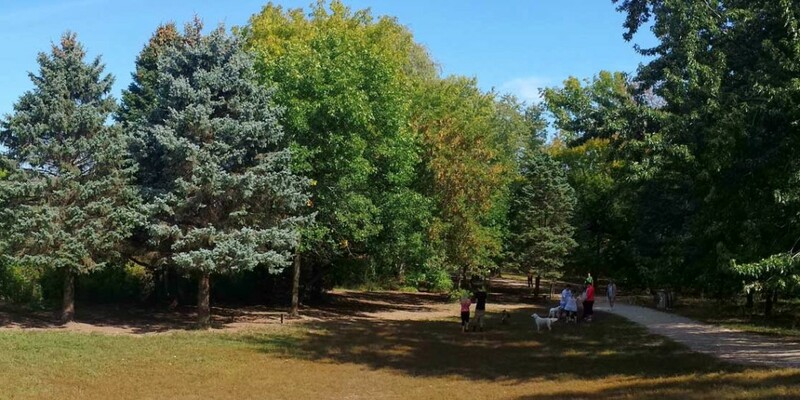 The seven acres are fenced so dogs are encouraged to romp and play in safety – off leash. Few people knew, at this time, that the beautiful park their dogs shared was in fact owned and maintained by the generosity of a single family. With Joseph Uihlein’s passing in 1994, Georganna, quietly and behind the scenes, continued with the financial support that had always been given to Muttland Meadows. In February of 1995, a small group of Muttland Meadows users saw that the park needed some minor maintenance and repair. Sandi Cooley approached the Trustees and asked permission to cut some dead branches and repair some fencing at our (the park users) expense. We didn’t want to be a burden to the estate and have them close the park. So, in March of 1995, we encouraged dog owners to donate some financial help so we could maintain the park and keep the dogs safe. In late 1995, the Uihlein Trustees informed us that we (the users of the park) would be responsible for all expenses except the property taxes which would be taken care of by the Uihlein estate. Mrs. Uihlein, at this time, was in poor health and we certainly didn’t want to cause her any concern. It was with great sadness and regret that we observed the passing of Mrs. Uihlein in 1996. What was to become of our beloved Muttland Meadows? It was unlikely that the heirs would take an interest, since the Uihlein’s hadn’t had dogs for years. Luckily, in August of 1996, Sandi Cooley made contact with the Uihlein Trustees and was able to talk with them about the future of Muttland Meadows. If Sandi had not been the contact person I am positive that Muttland Meadows would not be in existence today. Sandi then solicited the help of Attorney Adam Gerol to guide us through some of the many legal matters we would be facing. Adam, had spent countless hours in helping to work with the Uihlein Trustees to make the donation of the land toward becoming Muttland Meadows Incorporated. Adam called upon another Muttland user, Attorney Josh Levy, to help shuffle through the legal red tape. Josh, a lawyer with Beck, Claet, Malony and Bamberger performed the necessary work to incorporate Muttland Meadows as a nonprofit organization on a pro-bono basis. His law expert, John Vitek, worked quickly to complete everything. In October of 1996 Muttland Meadows became incorporated and that same month the land was deeded over to the corporation. In July of 1997 we were certified to solicit funds and on November 6, 1997 we officially became a nonprofit organization. Throughout Muttlands long history there have been many wonderful people who have helped to maintain Muttland Meadows through a selfless donation of time, expertise and financial help. Without the donations of those people who use the park we would be forced to close the gates to all the dogs who love to run free. Today, Muttland Meadows is supervised by four officers & board members who work together on the management of the park operations.